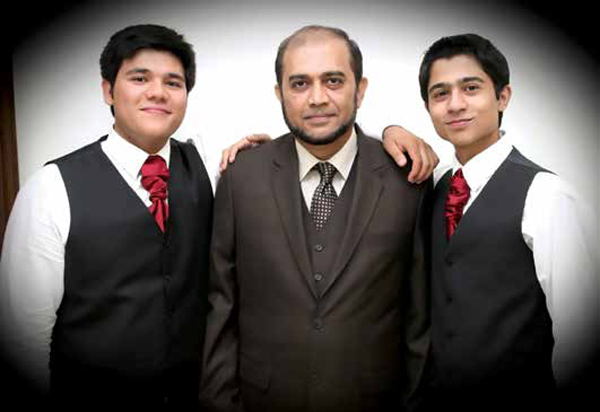 Abdul Waheed poses with his sons, Bilal Sheikh and Haseeb Sheikh. Waheed recently stepped down from Saudi Aramco after completing more than 40 years. He worked in various assignments, mainly in Maintenance Planning and Scheduling and Maintenance Engineering/Operational Excellence implementation. Dhahran — Abdul Waheed joined the Arabian American Oil Company — which later became Saudi Aramco — on May 30, 1978. He retired last month after completing 40 years and five months of continuous service. During this period, he worked in various assignments, mainly in Maintenance Planning and Scheduling and Maintenance Engineering/Operational Excellence implementation. He has witnessed three major Computerized Maintenance Management Systems — from MMP, to AMMS, and then SAP. He was very instrumental in the smooth transition of these changes in the company. Waheed was noted for his contributions to the development of young Saudi professionals and displayed a great passion for the development of the Maintenance workforce by sharing his knowledge and experience. Holding a bachelor’s degree in science as well as various certifications, including a Green and Black Belt for Lean Six Sigma, he recently helped lead the certification of Maintenance Engineers for Certified Maintenance and Reliability Professional, as well as for technicians as Certified Maintenance and Reliability Technicians. He enjoys reading articles on maintenance and reliability (M&R) as well as discussions on equipment reliability and process improvements. Waheed plans to spend time with his children in the U.S. and Canada, and will reside in his home country of Lahore, Pakistan. He will continue his passion in promoting the education of M&R by completing a book, as well as through volunteer work. He and his wife, Yasmeen, have three daughters who are settled with their families, and five grandchildren in the U.S. and Canada. They also have two sons, Bilal Sheikh and Haseeb Sheikh. Bilal is a mechanical engineer from Drexel University Pennsylviania, U.S. and is now completing a post graduate diploma in global business management in Canada. Haseeb is computer engineer fromDrexel University now working with Dell USA as a software engineer. Waheed can be reached by phone and whatsapp at +92-334-048-3700, and also by email at [email protected].